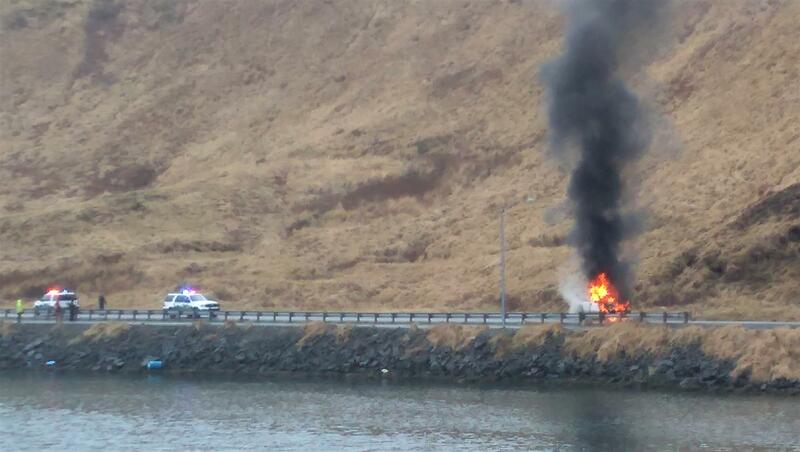 A truck caught fire April 4 on Unalaska's Airport Beach Road. No one was injured in the incident, which is under investigation by the Department of Fire and Emergency Medical Services. No one was injured in a truck fire that erupted Thursday on Unalaska's Airport Beach Road. The incident occurred on the straightaway below Bunker Hill just after 11:30 a.m.
Resident Nathaniel Buesing witnessed the blaze. "I heard the police siren going off," he said. "I looked out my window and saw a truck on fire, so I decided to video it." That video shows the hood and cab of a white pickup engulfed in flames while a big cloud of black smoke billows into the air. It also captures the arrival of emergency responders — and what sounds like the pop of a small explosion. Fire Chief Ramona Thompson said her team was on-scene by 11:41 a.m. to douse the flames. By that point, the truck's driver had already fled the vehicle. "We do not know what caused the fire," said Thompson. "That's still under investigation." She said she was happy with firefighters' response, which took less than 20 minutes. Unalaska should build a brand-new police station — in addition to renovating the existing building that's long housed all of local law enforcement. Those are the preliminary recommendations from Jensen Yorba Lott, the Juneau-based design firm hired to analyze the city's 32-year-old Department of Public Safety building. It currently includes police, fire, corrections, and more — but architect Corey Wall said that's not working. Six new firefighters have joined Unalaska's volunteer force, bringing its once-depleted ranks to a total of 26 members. On Tuesday, Fire Captain Mike Hanson congratulated the new volunteers on completing their Firefighter 1 certifications. He also replaced their yellow helmets with black, signaling their transition from trainees to full firefighters qualified to enter burning buildings. After spending five decades as a consolidated agency, Unalaska's Department of Public Safety has been split into two entities. On Tuesday, the City Council passed an ordinance — despite concerns about cost — creating two new standalone departments: one for fire and emergency medical services, and another for police, corrections, and dispatch. The 5-1 vote signaled an end to the council's long debate over restructuring — an end that Mayor Frank Kelty said he's happy to reach.